It’s the Australian GP this weekend and that means it’s the start of a new Formula One season. Lewis Hamilton will be looking to defend his first World Championship, but its not going to be easy with all the new rule changes coming into effect this year. No one is more excited about the new F1 season and the Aussie GP than me, I was even lucky enough to attend the event myself back in 2004 during the Schumacher glory days. We couldn’t miss the opportunity to use the new Formula 1 season as an excuse to look at the drivers of the sport and write a little bit about them while we look at the fashions of the sport and see what sunglasses (or prescription glasses) are worn by the drivers down the pit lane. Lewis Hamilton has become a household name in his short two-year Formula One career, he certainly had us all on the edge of our seats last year when he took the title decider to the last corner of the last lap to win the World Championship. To say that it was a nail-biter is the understatement of the century, you literally couldn’t make it up! 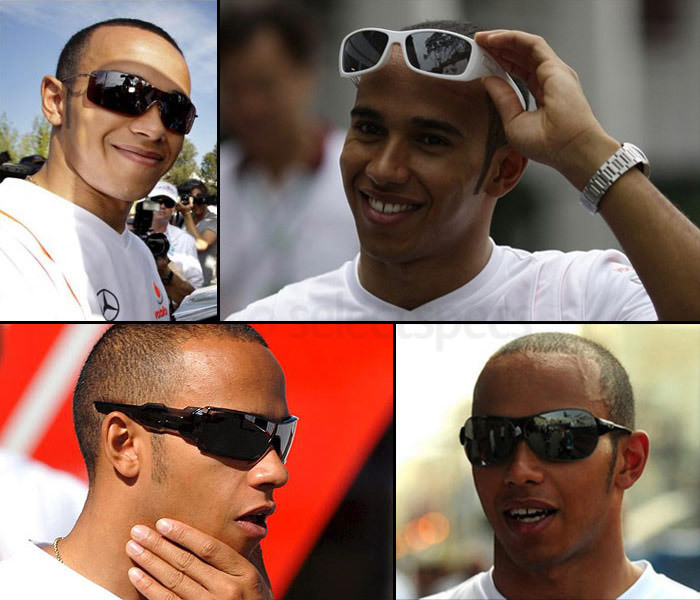 The youngest ever F1 World Champion is more often that not seen walking around the F1 paddock without any sunglasses at all, but on the occasions when he does don his shades it seems that Lewis appears to be a big fan of various styles of Oakley sunglasses. Lewis Hamilton is a bit of a lucky boy really; he can pretty much wear any style of Sunglasses and get away with it, although I think these Aviators are just the right kind of cool for a top-level racing driver like Lewis. Here he is with his Pussycat Doll girlfriend Nicole Scherzinger at Nelson Mandela’s 90th Birthday celebrations in June 2008. Some guys really do have it all! Ferrari driver Felipe Massa came within one point of winning the championship last year and in fact thought he had it in the bag when he won the final race of the season at his home Grand Prix in Brazil, only to be told seconds later that Lewis Hamilton had overtaken Timo Glock on the last corner to gain the 5th place he needed to win the championship. For Massa it must have been like opening all his presents at Christmas and then having them immediately snatched away and made to watch as they are thrown into a compactor and crushed to a cube. Regarded by many, including the legendary Formula One commentator Martin Brundle as “The Most Improved Driver on the Grid” Massa would have made a very worthy World Champion, actually winning more races than eventual champion Lewis Hamilton during the course of the season. Felipe Massa is my personal tip to become World Champion in 2009, and good luck to him. Felipe Massa can often be seen around the F1 paddock brandishing a pair of Ray-Ran sunglasses such as these RB3362 – Cockpit Aviators or RB3311 Shield style sunglasses. The 2007 World Champion and Ferrari driver Kimi Raikkonen undeniably has bags of talent but no longer is he the number one driver in the Ferrari team since Felipe Massa has proved himself to be such a worthy contender to the title. In 2008 Kimi was accused of lacking interest in the title and there were question marks over his motivation in Formula One as he consistently under-performed despite his incredible ability as a racing driver. Perhaps if he had spent less time worrying about his image and promoting his own brand of Tag Heuer Speedway sunglasses (above) he might be a double world champion by now. Lets hope he is a bit more settled this year as it would be great to see Kimi back in the hunt with the other contenders again. 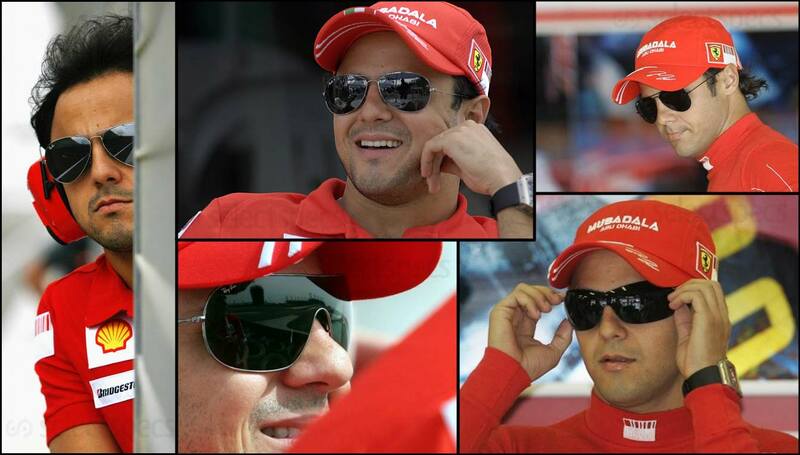 Kimi Raikkonen’s own design of Tag Heuer sunglasses can be seen modelled by the man himself in black or red (above). Not sure about those square-framed white sunglasses though (bottom left), they remind me of the old-fashioned 3D glasses you used to get in the cinemas in the 1980’s! Double World Champion Fernando Alonso was brilliant to watch last season, especially as the Renault team developed the car to race winning ability towards the end of the season. If the team is as good this year as it was at the end of last season, Alonso might find himself in with a decent shot of a third world championship by the end of the year. Martin Brundle refers to Alonso as “The most complete driver on the grid” and I have to agree with him. Here, Fernando Alonso can be seen wearing a variety of sporty Quiksilver sunglasses to varying degrees of success over the course of the last few years. BMW Sauber driver Robert Kubica actually stood an outside chance of winning the championship towards the end of the season last year and is definitely going to be one to watch this year. His driving ability is not in question, if anything, its down to the team to provide him with the support that he argued was lacking last year as they concentrated on developing the car for the 2009 season. I for one, really cant wait to see if it has paid off and they can provide him with the equipment needed to stand a decent chance of becoming a championship contender this year. 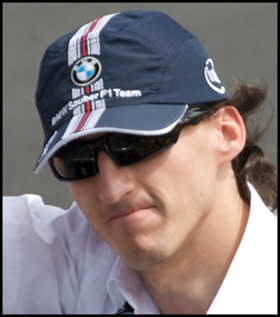 F1 racing driver Robert Kubica is rarely seen wearing glasses and even here, his Oakley sunglasses are partially concealed below his cap. Lewis Hamilton’s McLaren teammate Heikki Kovalainen has got a lot to prove this year as he aims to up his game by winning more races. Heikki wears Zerorh+ RH 602 wraparound sunglasses that are probably more suitable for snowy mountain conditions rather than an F1 paddock. I must admit though, I’m loving those Harry Potter-like beer bottle glasses! Thank God he doesn’t need these to drive. Good old Jense was saved from the ever-growing queues signing on the dole down his local Job Centre at the eleventh hour when his Honda team was taken over by Ross Brawn and rebadged Brawn GP. Early signs are that the new Brawn car is potentially the fasted on the grid and at the time of writing, Jenson Button is favourite with the bookies to win the Australian GP. Formula 1 racing driver Jenson Button is nearly always seen wearing Ray-Ban sunglasses. Here he models a selection including Ray-Ban Wayfarer 2140 Sunglasses, Ray-Ban 3026 Aviator Sunglasses and Ray-Ban 3362 Cockpit Aviator Sunglasses alongside team mate Rubens Barrichello. Jenson Button’s teammate Rubens Barrichello, one of the nicest guys to ever drive a Formula One car is a bit of a Ray-Ban connoisseur choosing some square-shaped plastic Ray-Bans and some Metal framed Ray-Ban sunglasses here. 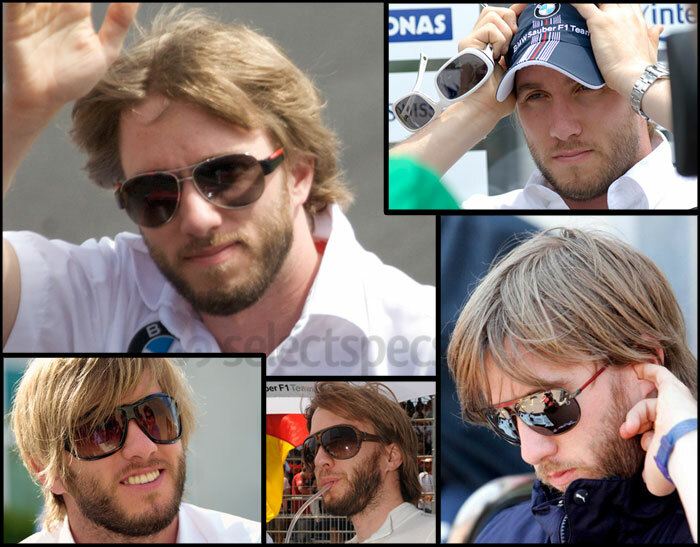 The bearded BMW Sauber driver Nick Heidfeld wears a variety of sunglasses including Prada Linea Rossa PS51HS (Prada Red) sunglasses, Emporio Armani sunglasses or Diesel DS 0085 Sunglasses with a wood finish; generally Heidfeld tends to go for the fashionable oversized frame styles. Aussie Red Bull Renault driver Mark Webber is a big fan of Oakley Sunglasses. Williams driver Nico Rosberg normally wears Aviator Style Sunglasses, unless he’s dressing up like Elvis Presley! 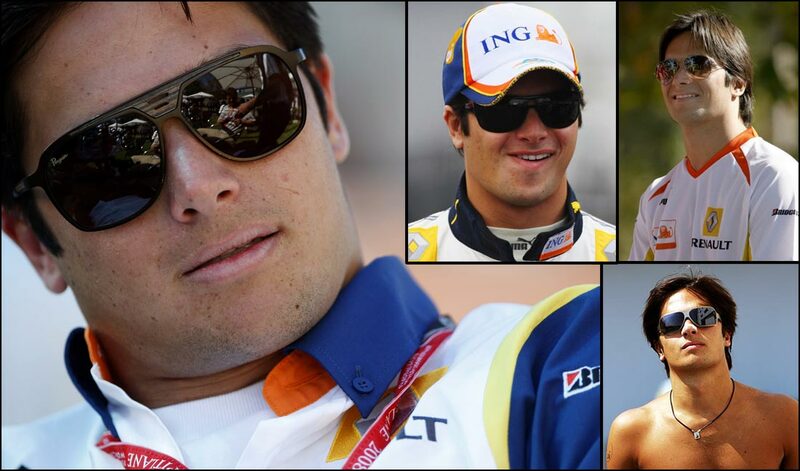 Renault Formula 1 racing driver Nelson Piquet Jr. fancies himself as a bit of a model wearing all these sunglasses, including Penguin and Ray-Ban 3026 Aviator Sunglasses (the same as Jenson Button). Toyota driver Jarno Trulli is normally seen wearing sporty, colourful designs when it comes to sunglasses, usually with coloured, mirrored lenses, except for the odd occasion when he changes it up a bit with some Aviator Sunglasses. Toro Rosso driver Sebastien Bourdais is one of the most successful drivers around, winning the Champ Car World Series (sometimes referred to as the American version of Formula One) 4 times in a row. The French man is one of those rare drivers who wears prescription glasses even when racing (as opposed to contact lenses). More recently he wears square-shaped rimless glasses, which no doubt give him the best possible unobstructed view for driving/racing. Force India Formula 1 racing driver Giancarlo Fisichella is often seen wearing some unusual styles of sunglasses, but I suppose when you’re Italian and you’re a Formula One driver, you can get away with it. Force India Formula 1 racing driver Adrian Sutil wears Ray-Ban sunglasses and generally goes for the fashionable large styles. We are hoping for another great season this year with even closer racing under the new rules and hopefully a lot less politics. Our predictions for the year are a tight championship battle between, Hamilton, Massa, Raikkonen, Alonso, and Kubica and we might also get a bit of Jenson Button, and Sebastian Vettel thrown thrown into the mix here and there, which should be fun. Ultimately though, I feel Massa’s performance from last year will continue and he should come through and win it in the end. What do you guys think? Well done Mark Webber on your first GP win. It was great to see. Really pleased for you. Might be able to fight for the championship at this rate. Best wishes to Felipe Massa and his family. He’s one tough cookie. Get well soon buddy. We want to see you back on track fighting for the championship as soon as possible.